The “in” colour this summer is definitely going to be green. Not only is Green Lantern, the big budget Hollywood film starring Ryan Reynolds in the titular role, being released in theatres (everywhere!) this year, but the character has a highly anticipated straight-to-DVD animated film on the horizon as well! Remember how much you loved the monthly Green Lantern comic book series a few years ago? You know, before everything exploded and spun out into various tie-in series during the cool-but-too-mammoth Black Lantern storyline? Before DC Comics and their parent bean counters, Warner Brothers, got involved with publishing operations? (I kid. Those were fun days, too.) 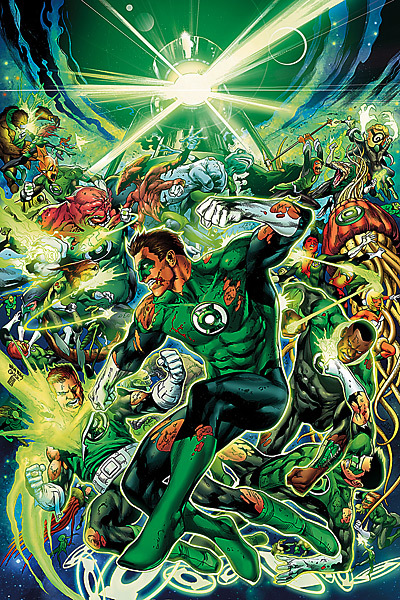 Remember the fan favourite Sinestro Corps War over-arching storyline that ran within the pages of Green Lantern proper? Well you’re about to live those comic book glory days all over again this spring and summer. Issue #64 of Green Lantern, out today, brings us the beginning chapter of a new storyline: “War of the Green Lanterns.” Brilliant writer Geoff Johns, the creative guy that has breathed new life into the Emerald Warrior, has been building to this point for the better part of five years! That’s right fan boys and fan girls! The moment you’ve been waiting for is afoot: the dissolution of the famed intergalactic police force known as the Green Lantern Corps! Now, which villain has wanted that end game for a long, long time? Oh, I know. I’ve known for nearly as long as I’ve been reading the series. But I’m not telling today! So, if it’s epic, heroic, sci-fi adventure you’re looking for, all served up on a monthly basis, make the Wednesday run now. Go find out what all the green excitement is about!